For a majority of us, a trip to the grocery store is all we need to do to pick up meats, produce, and other ingredients that we need to put a meal on the table for our families and friends. It is easy for us, and in essence we have the family farmer and rancher to be thankful for. Growing up on a family farm and ranch in North Dakota, I know how difficult farming and ranching can be and often think about the work my Dad did keeping us all fed. As a child, Dad grew up farming and ranching and there wasn’t much question about what he would do when he was grown. He farmed wheat, oats and barley, and raised cattle, hogs and poultry. Life was not always easy. Farmers and ranchers are at the mercy of Mother Nature. And while some years proved to be bountiful, others could be more of a struggle. Each spring and summer there was concern for the crops (and our own personal garden as well); if there would be drought conditions, too much rain, an infestation of insects, or damage from wind and hail caused by severe storms. Taking care of the livestock is a year round job for ranchers. I often think of Dad feeding our cattle in a full woolen facemask in sub zero weather and still coming into the house with a frost bitten face. It was also not unusual to see him carrying in a newborn calf to place in our bathtub, usually if they came early, or a snowstorm came late. I remember a severe electrical storm that occurred. Dad went out to check on the hogs, and on his way back into the house, a lightning bolt brought him to the ground. He had not been directly struck, but he could feel the sizzle of the electricity above his head. Needless to say, those of us in the house dove under the kitchen table. When Dad came in, he said, “What the hell are you doing under the table?” That was Dad, making light of a stressful situation. However, maybe that was a personality trait he needed to possess to be a farmer and rancher. I cannot help but think about the connection that my Dad, and other farmers and ranchers, must have to the land and nature. I recall a time when I was out for a run on a dirt country road and a storm was brewing in the West. It created such a beautiful picture of dark blue sky with the contrast of golden wheat rustling in the wind and the sweet smell of rain in the air. How many times did Dad, in his 60 plus years of farming and ranching, experience these awesome moments, yet kept them peacefully captured in his own mind? We as consumers can only imagine the hard work, dedication, sacrifice and rewards the family farmer and rancher experiences, each time we go to the store or open our kitchen cupboards. 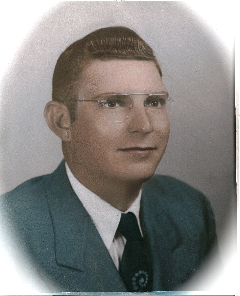 Therefore, it is only appropriate that I dedicate Chatty Gourmet in memory of my Dad, Ralph Paulson.